Private Apartments (Khas Mahal), in the Fort, Agra. bl.uk > Online Gallery Home	> Online exhibitions	> Asia, Pacific and Africa Collections	> Private Apartments (Khas Mahal), in the Fort, Agra. 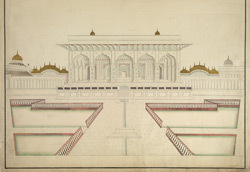 Watercolour of the Khas Mahal in the Agra Fort, Uttar Pradesh, by an anonymous artist working in the Agra style, c. 1820. The Khas Mahal (private pavilion), part of the Fort-Palace Complex at Agra, was built in 1636 and stands on a terrace in between the River Jumna and a formal garden. There are two pavilions on either side of the Khas Mahal with 'bangla' roofs, a design resembling the curved thatched roofed huts of Bengal. The large quadrangle facing the Khas Mahal is the Anguri Bagh which was laid out in geometric flowerbeds and terraced walks radiationg from a central stone platform. This massive fort is 2.5 kms long and the walls are 20 feet high. It is the predecessor of the Red Fort at Shahjahanabad.